You may also be interested in our many other pages on migraine on this site. Other pages mainly devoted to migraine in women are pages on migraine in pregnancy and menopause. There is also a page devoted to treatment of menstrual migraine. Migraines are defined as recurrent headaches separated by symptom-free intervals and often accompanied by nausea and light sensitivity. Migraines are often accompanied by visual symptoms and are relieved by sleep; furthermore there is usually a throbbing quality. Migraine prevalence vs age in women (dashed) and men (solid). (Adapted from Stewart et al, 1994). The study that provided this data was according to age rather than time of menopause. This is probably the reason that this plot does not show the secondary peak in migraine that occurs perimenopausally (Macgregor and others). Migraine by age in women and men, in the author's "dizzy" clinic practice. 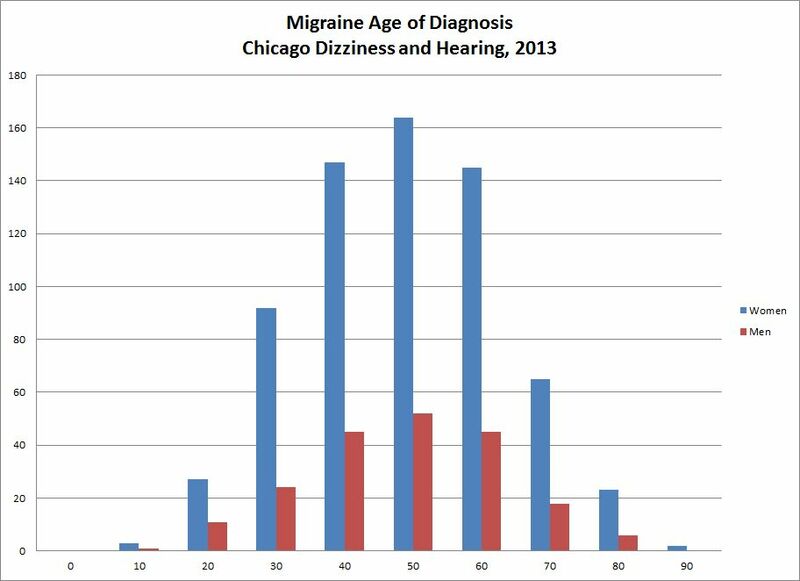 This graphic clearly shows that women have far more dizzy migraines than men, and also that the peak age for migraine associated vertigo is not 35 as in the general population, but rather is 50 in patients who go to the clinic for help with their dizziness (in both men and women). Women have more migraine about 3 times more commonly than men. This is attributed to hormonal fluctuations, but may also relate somewhat to women having estrogen. Boys and girls prior to puberty have equal rates. However, starting at roughly the age of 12, the prevalence of migraine in women takes an abrupt increase compared to men. The prevalence of migraine peaks in women in the middle of their reproductive years -- about the age of 35. There is also a second peak of migraine at the time of menopause (see below), where migraine in women has a prevalence of roughly 30%. To our knowledge, migraine and hormonal influences has not been studied in individuals taking estrogen that are not women (i.e. men on estrogen). The role of hormones and migraine is complicated, and might require one to separate out subgroups of migraines for rational therapy. There is good evidence that at least some of the increased incidence of migraines in women is caused by going from a high to a low estrogen state (Somerville, 1975; MacGregor et al, 2007; MacGregor 2015). As can be seen below, there are two points that this happens -- just after ovulation, and a few days prior to menstruation. Kiesner and Martin (2013) reported that there is a mid-cycle pattern (16%), a menstrual pattern (51%), and a noncyclic pattern (33). Other pieces of information supporting the estrogen withdrawal conjecture is that migraines typically diminish in women after roughly 4 years of menopause, and migraines also typically diminish in pregnancy, when estrogen levels are high but fairly constant. Here, one might want to consider chicken vs egg -- in migraine people are often hypersensitive to nearly everything. Perhaps fluctuation is the problem, and not estrogen at all. On the other hand, high stable estrogen levels may provoke migraine aura (Macgregor, 2017). Chauvel et al (2018) found that elevated estrogen increases the frequency of cortical spreading depression (related to migraine aura), in rat. They suggested that "these findings may explain why migraine auras can appear during pregnancy and why menstrual-related migraine attacks are rarely associated with an aura." This would make one wonder if high estrogen is associated with visual vertigo, as visual vertigo often appears in women in the middle of their reproductive years. Maasumi et al (2017) recently provided an excellent review of menstrual migraines and treatment options. The core idea is that increased headaches around menses are correlated with fluctuations in estrogen level (a withdrawal effect, see above). Estradiol drops from about 300 to 50 normally, around the time of menstruation. Strangely though, women with menstrual headaches are reported to have LESS fluctuation of both estradiol levels and the trigeminovascular vasodilator system than normal subjects (Ibrahimi et al, 2015). One would expect the opposite. It has been suggested that menstrual migraines have less aura than non-menstrual migraines. (Chauvel et al, 2018). We are not sure about this ourselves. Martin et al (2006) stated that 'The overall prevalence of menstrual migraine in the general population is approximately 3%, but it is much higher within populations of migraineurs; 35% to 51% of female migraineurs have “menstrually related MWoA,” while 7% to 19% have “pure menstrual MWoA”'. Women with menstrual migraines have similar ovarian hormones as women without menstrual migraines (Stewart, 1975). This rather old study looked at only 6 migraine patients however, and may have missed some of the fine points. Nevertheless, it is generally thought not very productive to check "hormone levels", as the difference in the migraine frequency appears to be related to personal susceptibility rather than estrogen, per se. Treatment of Menstrual migraine: See this page. Pregnancy and Migraine: See this page. Menopause and Migraine: See this page. Chauvel, V., et al. (2018). "Estrogen-dependent effects of 5-hydroxytryptophan on cortical spreading depression in rat: Modelling the serotonin-ovarian hormone interaction in migraine aura." Cephalalgia 38(3): 427-436. Dodick, D. W. (2009). "Review of comorbidities and risk factors for the development of migraine complications (infarct and chronic migraine)." Cephalalgia 29 Suppl 3: 7-14. Epstein, M. T., et al. (1975). "Migraine and reporoductive hormones throughout the menstrual cycle." Lancet 1(7906): 543-548. Force, U. S. P. S. T., et al. (2017). "Hormone Therapy for the Primary Prevention of Chronic Conditions in Postmenopausal Women: US Preventive Services Task Force Recommendation Statement." JAMA 318(22): 2224-2233. Granella, F., et al. (1997). "Treatment of menstrual migraine." Cephalalgia 17 Suppl 20: 35-38. Kiesner, J. and V. T. Martin (2013). "Mid-cycle headaches and their relationship to different patterns of premenstrual stress symptoms." Headache 53(6): 935-946. MacGregor, E. A. (2017). "Migraine, menopause and hormone replacement therapy." Post Reprod Health: 2053369117731172. Martin, V. T. and M. Behbehani (2006). "Ovarian hormones and migraine headache: understanding mechanisms and pathogenesis--part I." Headache 46(1): 3-23. Martin, V. T. and M. Behbehani (2006). "Ovarian hormones and migraine headache: understanding mechanisms and pathogenesis--part 2." Headache 46(3): 365-386. Maasumi, K., et al. (2017). 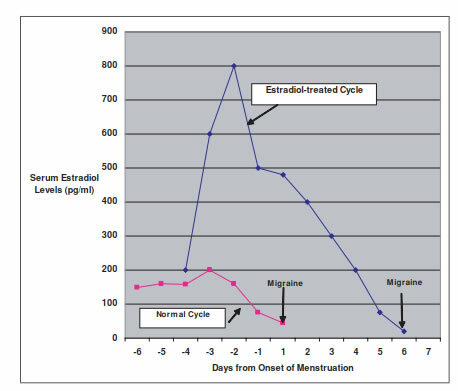 "Menstrual Migraine and Treatment Options: Review." Headache 57(2): 194-208. Schurks, M., Rist, P. M., Bigal, M. E., Buring, J. E., Lipton, R. B. and Kurth, T. (2009). "Migraine and cardiovascular disease: systematic review and meta-analysis." BMJ 339: b3914.